Happy Kitchen Sink Stamps Monday! If you missed out on last weeks Black Friday Sale - you're in luck! Kitchen Sink Stamps is running a Cyber Monday & Tuesday SALE! When you use code LISA15KSS you'll save 15% on all your purchases from Kitchen Sink Stamps!Wait...that's not all! Look for special items on sale throughout the store. In order to get the 15% savings, you need to enter code LISA15KSS at checkout, but HURRY, this offer is only valid Monday Nov. 30th - Tuesday Dec. 1st (midnight - midnight EST) at Kitchen Sink Stamps. As you can see, the Herringbone Technique is a bit addicting! Here I used the Basic Grey Wassil papers to create my background. I used Spellbinders Oval Dies to cut my opening to fit the Shake It Shaker Card Pouch. 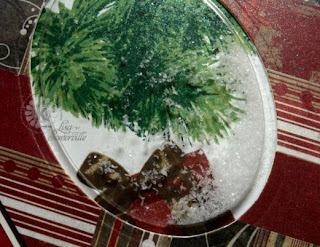 Before I adhered the Shaker, I stamped my Branch from Kitchen Sink Stamps Multi Step Build a Garland on White then stamped the Present from Kitchen Sink Stamps Multi Step Gift below the branch. Before adhering the Shaker, I used removable adhesive to attach my layers, then lightly misted them with Pearl Glimmer Mist. I took the layers apart, placed some Polar White Flower Soft over the image, then adhered the Shaker. 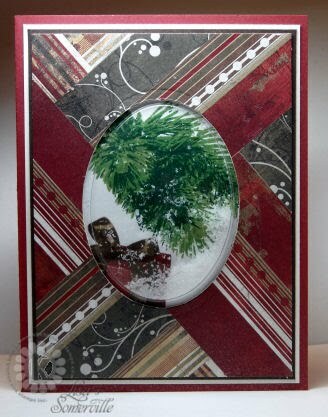 I placed the Herringbone layer over the shaker, adhered to a Chocolate Panel, White Panel, then to my Cranberry base card. Stamp Branch as follows: #1 Stampin' Up! Old Olive stamp off, #2 Memento Cottage Ivy, #3 Memento Cottage Ivy, #4 Stampin' Up! Handsome Hunter. Stamp Gift as follows: #1 Stampin' Up! Cranberry Crisp stamp off, #2-4 Cranberry Crisp. The Bow was stamped as follows: #1 Stampin' Up! Soft Suede stamp off, #2 Stampin' Up! Soft Suede, #3-4 Stampin' Up! Chocolate Chip. New stamps will be arriving at Kitchen Sink Stamps December 7th, along with a new KSS Challenge! What a fabulous creation with the tree and gift sprinkled with snow in the Shake It dome! Love that gorgeous herringbone background you have created. Another beautiful card, those bg's turn out so beautiful, guess I'll have to give in and try my hand at it too. The stamping looks is a piece of art! Oh this is just sooo beautiful, Lisa!! Your backround is just stunning!! What a fantastic card, Lisa!! OK, I'm so curious and dying to try the herringbone background ;) The shaker pebbles looks so cool, too!